Barcelona is as vibrant a city as they come. The bright Catalan capital has an impressive repertoire of gorgeous buildings, galleries, gardens, and even the food itself is a work of absolute art. The city is on a superb stretch of coast on the Mediterranean, which allows Barcelona to give its’ visitors the finest seafood available and glorious sands to sun worship. For an adventure into a dream city of art, food and silver sands. Barcelona offers the whole package. When art and Barcelona are often uttered in the same sentence. The two names that crop up are Picasso and Gaudi. Each utter titans in the art world. Picasso himself is arguably the most famous artist in all history and Barcelona is a part of the history that made Picasso a god in the pantheon of art. In his younger days, Picasso started his craft here. So Barcelona is gifted with the Picasso museum. This is the largest collection of work by Picasso, and a bucket list trip for everyone. With over 4,000 pieces by the maestro this is an adventure that will occupy everyone for a day, and still, have people coming back for more the next day. It is worth noting that this museum isn’t just in any ordinary building, the museum is located in not one, not two, but five enormous palaces! This is a definite spectacle for any and all visitors. Palaces are one resource that Barcelona is not short of. Gaudi has produced some truly deep dream state fantasy creations that are straight out of near impossible. 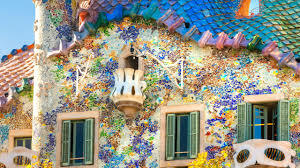 For a short list of these insane creations; there is Casa Vicens, la Pedrera, Parc Guell, Palau Guell, Colonia Guell, El Drac de Gaudi at Finca Guell, Casa Batllo, Casa Calvet, La Sagrada Familia, and Cascada Fountain at Park de la Ciutadella. Wow, Barcelona will have architect fanatics occupied for a long time on a trip. La Sagrada Familia is by far the most recognisable and physically impressive. As the massive cathedral is a wonder of the world. The four immense spires allow tourist to get a wonderful view of Barcelona. There are also guided tours offered which will prove to be incredibly educational about this monument to Man’s relationship with the material world and the spiritual. There is a chance you will walk away from this tour with a new favourite monument, as La Sagrada Familia is in a world of its’ own, much like all of Gaudi’s work. Another work by Gaudi that is worth the visit is La Pedrera. A building that looks like it was moulded out of clay, by the hand of some giant. The curved stone is so perfect it looks malleable to the touch and the intricate iron railings appear to have a life of their own. La Pedrera is a feather in Barcelona’s cap as the building is a UNESCO world heritage site. Visiting Barcelona’s beaches is a magnificent way to relax after a climb up La Sagrada Familia or a walk around the city. The beaches are very well maintained and have many seaside bars to refresh oneself after a trip into the fantasy world of Picasso and Gaudi. @Barcelona GO! Rob Whitworth on Vimeo. The Mediterranean waters, the sleek sandy shore, and the warming Barcelona sun is a rejuvenating experience for any traveller or local. So it is highly recommended to see the natural beauty of Barcelona as she is stunning. The sapphire shore of Barcelona does not just gift her visitors a sanctuary to unwind. The Mediterranean Sea allows Barcelona’s chefs to become artists also. The local cuisine is as flavorful as it is colourful. Many visitors can be forgiven for thinking Barcelona will blow them away with paella, and they would be technically correct. However, most locals would suggest the noodle based version for visitors to really appreciate the power of Barcelona cooking. The dish is called fideua, and it is a picture of colour, the warming yellows and reds of the noodle, peppers, and crustaceans complemented by the dark blues and purples of mussels. The dish is a complement for the senses, the smell, the look and most importantly the taste! Take a trip to a technicolour paradise, where the people, culture and food are all radiant. As there will be nothing more refreshing to the soul as a trip to Barcelona where all of this is to be had for eager visitors.So make Barcelona the next holiday destination, as it really is a city that in every regard is art.